On a baking tray, arrange cauliflower pieces into a single layer. Drizzle with olive oil and salt. Bake the cauliflower for 10 minutes, then remove from oven, mix and place back in the oven for an additional 10 minutes. Remove cauliflower from oven and set to the side. Unroll pie crusts and cut each crust into 4 equal pieces, making a total of 8. Place a few heads of cauliflower in the center of each piece of pie crust, then sprinkle the tops with a teaspoon of parmesan each. Fold each pie crust over to seal all ends together. Using a fork press into the edges to ensure seal. Poke each empanada with the fork on the top. Place the empanadas on a mat lined baking sheet. In a small bowl, whisk the egg and water together to make an egg wash.
Brush each empanada with the egg wash, and then bake for 20 minutes. Remove from oven and allow to cool for 5 minutes. Enjoy! You can freeze any unbaked empanadas to enjoy at a later time. 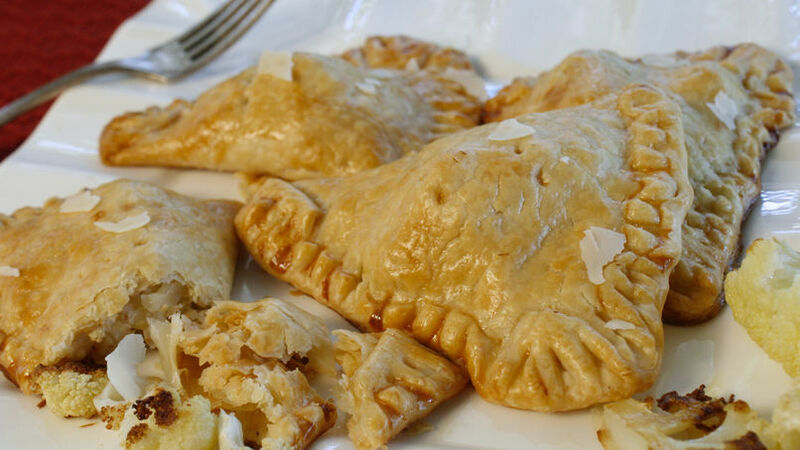 Talk about a highly versatile Latin food… the hearty empanada works for so many occasions and are very convenient. I've taken them on picnics, snuck them into the movie theater, taken them to Disneyland, walked along the beach and shared them with my man; and they work really well as a snack on the go and also for dinner as the main course. Like I said, they are very functional and all-purpose! For those of you who love these little pockets but care about calories, I've made a recipe just for you: Parmesan cauliflower empanadas. They are a light alternative to the regular sweet and savory empanada, but I guarantee you that they are just as luscious and flavorful.